Beginning Friday, February 8th, 2019, we will be offering a group barn management class every Friday evening, led by Trainer Marisa Kravatz. This is an excellent way to learn about horsemanship and make new friends! The Class will be 1 hour and 30 minutes, 7pm - 830pm, and is $50 per student. Please contact the office to sign up for the class! Below are additional classes offered by SRRC; if you are interested in taking a class, please contact the office for pricing and scheduling. SRRC is now offering group or individual one hour tack-up lessons for beginners as often as possible. We believe in horsemanship, not just horseback riding. 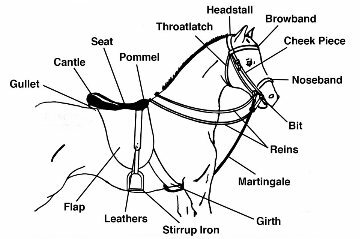 A very important component of horsemanship is understanding the equipment you are using on any given horse: both how it is put on, and how and why it works. The tack-up lessons will allow time both for demonstration of the equipment that we use, and hands on practice with someone standing by for instruction and assistance. General grooming and equipment used for grooming will also be taught in the tack-up lesson. And, of course, as we are very safety conscious, techniques for keeping both you and your horse safe will be taught so that everyone is safe and comfortable during the grooming and tacking-up procedures. Please call ahead or visit the office to schedule your lesson. Horsemanship classes are a terrific way to get acquainted with horses! This is a great class for beginners or people who are curious about horses. Horsemanship Classes are offered each month for beginners. Proper horse care techniques are taught and practiced to improve knowledge of horsemanship. An in-depth instruction into handling horses, grooming, equine nutrition, equine first aid and stall maintenance are covered and practiced. Students are given more advanced instruction and more responsibility as they gain experience and knowledge. What is a balanced seat? In the horse industry, the position of barn manager requires a person to be knowledgeable and competent in many areas concerning horses and people. An essential member of any large barn or stable, the barn manager is responsible for planning and orchestrating the day to day life of each animal in their charge. He or She is the glue that holds a barn or stable together, they oversee every aspect of horse care, from vet visits to exercise to supplies to management of barn employees. Their role is a significant one and beyond an almost expert knowledge of horses, it requires quick decision making, adaptability and leadership qualities.